The Eagle Ford Shale drilling rig count rose to 278 this past week. That is an increase of seven rigs from last week's count of 271 and is on par with the rig count two weeks ago. We talked about future rig activity in last week's note and we covered an announcement that Pioneer Drilling is Slowing Down in follow up. It is worth noting: Pioneer Drilling has experienced a slow down, but the overall rig count grew during that time period. Anadarko Petroleum is the operator up for review this week. 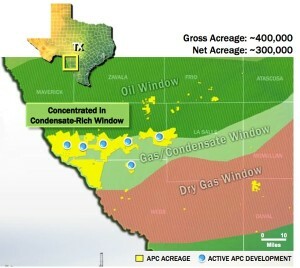 The company had operations in the Maverick Basin before the Eagle Ford boom took root and expanded its holdings as exploration proved the potential of the play. The company's most publicized development was when it received $1.55 billion ($12,000+/acre) in a joint venture agreement with Korean National Oil Company (KNOC). KNOC received a 33% interest in the company's Eagle Ford acreage in exchange. Anadarko now estimates resource potential across its acreage is greater than 1 billion boe (600 mmboe net to Anadarko). Anadarko has nine rigs running as of June 29, 2012, and has averaged more 10 rigs running over the past twelve months. The natural gas directed rig count (Smithbits) this past week fell to 73. Karnes and Webb counties are the only counties with more than ten rigs targeting natural gas. Henry Hub futures prices were up to more than $2.90/mmbtu and had held twenty cents higher last week at $2.82/mmbtu on Friday afternoon. WTI was trading around $84/bbl Friday afternoon, and looks to end the week up. Oil directed activity increased to 204 rigs this week. That's back up from last week when it fell below 200 for the first time since the beginning of April. 259 horizontal rigs are running in the region up from last week's count of 248. One water well is being drilled in McMullen County. Karnes County continues to lead development with 41 rigs and La Salle is up to 36 rigs this week. McMullen (31), Webb (28), Dimmit (26), Gonzales (23), DeWitt (20), Atascosa (13), and Live Oak (12) make up the top Eagle Ford counties. Come back weekly for updates or sign up for alerts.